Can you take the best practices of agile and apply them to your personal life? You bet you can. Johanna Rothman writes on how she manages her personal project portfolio the same way she advise other people to manage their work project portfolios. Hiring people for any role on an agile team (manager, ScrumMaster, product owner, team member, or architect) is challenging. Even though candidates might be able to answer your questions and prove their C++ programming skills, what you really want are people who are competent and capable, work well with others, and will fit in with your team. 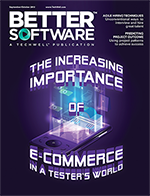 A farewell letter from Better Software magazine editor Joey McAllister. Project assessment and forecasting aren't magic. Payson Hall examines six factors that can increase the likelihood of project success. E-commerce and m-commerce industries continue to grow internationally, both in business opportunity and quality assurance requirements. Mukesh Sharma breaks down the core pieces of this technology you need to know in order to properly select the best tools and test approaches. Like “Moneyball” indicated for baseball, the secret to building a great software team is not drafting superstars but rather hiring team members with solid, diverse skill sets and attitudes that keep the team moving forward to success. Success as a team is a balance of a variety of soft and hard skills found in the individuals on the team, inter-team relationships, leadership, hard work, and even a bit of luck.